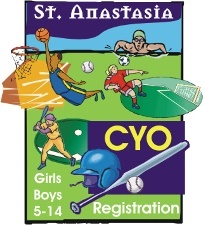 The CYO is pleased to field teams for competitive play in soccer, swimming, basketball, baseball, and softball. In addition, clinics are offered in soccer, basketball, and softball to introduce the basic skills of the sport to young children. Registration is handled online by our CYO Registration System. Online registration begins in mid-June for the new school year which begins in September. Registration is done on a rolling basis. The registration system lists the close dates of various programs but we encourage people to register as soon as possible. We cap the number of spots on each team (based on sport) and spots will be allocated on a first come first serve basis. We are looking to avoid the situation of fielding teams with too many players which leads to an unpleasant experience for the child and puts a undue burden on our (volunteer) coaches. If there is excessive demand and enough time given to react, the CYO can field more than one team in an age group. If you have any questions about the programs that are offered, please feel free to contact us by email.